The new Eleanor Boathouse at Park 571 in Chicago’s Bridgeport neighborhood creates the opportunity for greater community recreation and environmental stewardship of the Chicago River. 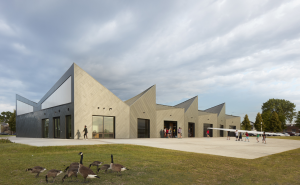 Designed by Studio Gang Architects, the 19,000 square-foot facility is the last of four new boathouses and river launches created by the Chicago Park District to reclaim the Chicago River as a major system of parks and water-based recreation. The striking design incorporates zinc panels from Rheinzink in both roof and facade applications. Approximately 23,000 square feet of Rheinzink prePATINA blue-grey Double Lock Standing Seam Panels cover the roof of both buildings. An additional 10,000 square feet of the company’s Flat Lock Tiles clad the facade in a diagonal installation. Zinc panels were also used to clad one of the other four boathouses completed earlier and also designed by Studio Gang Architects. 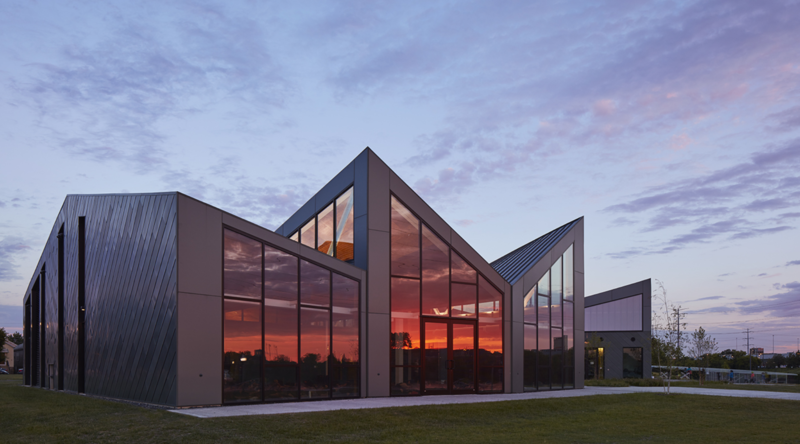 The WMS Boathouse at Clark Park on the northwest side of the city was the second of the new boathouses to open and utilized 7,000 square feet of vertically-oriented Rheinzink Flat-Lock Tiles for the facade. The panels for both projects were fabricated by Rheinzink systems partner Sheet Metal Supply Ltd. (SMS), Mundelein, Illinois. Installation of the panels on the Eleanor Boathouse was done by Bennett & Brosseau, Inc., Romeoville, Illinois. SMS vice president Ben Kweton credits Broom with providing the invitation to become involved in the project. “When Bennett & Brosseau approached us with the value engineering opportunity, we jumped at the chance to provide pricing and to remind the design team of the success of Rheinzink on the earlier boathouse project,” Kweton says. The design team also opted for a slightly hybrid version of traditional flat lock panels. “The tiles we fabricated had a slight offset at the top to bring the panel overlaps more into plane and to create a slight reveal,” Kweton says. The roof is one part of our home that often does not get the attention it deserves, even though it is one of the most important portions of a house or indeed any building. Most of the time, we do not even notice that there is something wrong with our roof until it turns into a major problem.